New York, New York. It's a hell of a state. New York is my home state; I'm a native Long Islander who heeded the call of the Oak Beach Inn to "Get out of NY before it's too late". So it was kind of interesting to be "welcomed" back into New York by this sign. 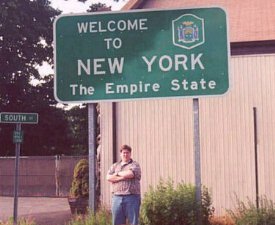 Now with all of New York's highways and byways, how (and why) on earth did I select this sign to represent New York in my quest? Well, if you've already read about my adopted home state of New Jersey, you know the difficulty I had in locating a simple "Welcome to New Jersey" sign. I was returning from a trip to my friend Vanya's apartment in Boston, Massachusetts. I took the roundabout way of going north on I-87 and then cutting over to I-287 south in Suffern, which borders Mahwah, New Jersey. After crossing the border, I noticed that again, there was no "Welcome to New Jersey" sign. I got off at Exit 66 onto NJ-17, and drove around for a bit, and again, no sign. I drove around the main vias in Suffern for a few minutes, then gave up, having crossed into and out of New Jersey several times. So while driving out, I decided that this was as good a time as any to get my New York sign, and so I pulled over, and voilà. Unlike other states, and especially Delaware, Rhode Island, West Virginia, and Massachusetts, New York apparently only uses one design of welcome sign. So the sign on an interstate is usually the same size as the one on little Orange Avenue in Suffern, Rockland County. With that in mind, I knew that this picture would suffice. And since we're talking about New York, please allow me to throw in one little shoutout. "Go Rudy Go!" Line from a Canuck-hating American, gazing upon the city of Toronto in the movie Canadian Bacon: "It's ... beautiful. It's like ... Albany." I remember, either the first time I went to the capitol or the first time I saw a picture of it, being a little disappointed. I was expecting a rotunda like other capitols. Instead I was presented with a great big Gothic mansion that a stranger looking for the capitol would probably drive right past. It was almost like my own state didn't even have a real capitol building. Construction began on the capitol in 1867, and it was completed in 1899 with a price tag of $25 million. That's $175 million in doggie dollars. The exterior walls are granite, and around the foundation, the walls are 16 feet thick. It was a conglomerate of many different types of arcitecture, from Gothic to Moorish to Romanesque. That may have been because one of the chief architect's assistants was probably running up the stairs with all of the blueprints and tripped over his shoelaces, and all the plans got mixed together, and next thing you know we wind up with an architectural mutt. The capitol burned in 1911, and the building would have been a complete loss until the fire's path of destruction was slowed by the papier-maché ceiling of the Assembly chamber. One of the capitol's most famous features is its grand staircases, which are made of sandstone and features sculptures of such all-stars as Washington, Grant, and Lincoln, as well as anonymous cherubs, carved into the stone. 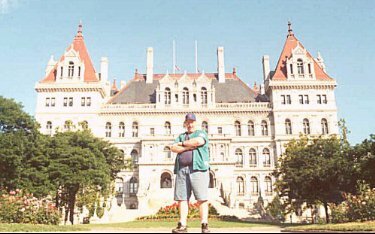 New York calls its capitol a masterpiece, a stunning and beautiful example of 19th Century Architecture, and widely recognized among state capitols. It is a nice building. I think the last time I was inside it was in 1988. As an executive mansion or something it would be great for me, but as a capitol I still prefer the traditional rotunda, a grand dome that is visible all over town, saying, "This is Capital City." This page loaded in 13.743 milliseconds.